FERN TRAUSCH is the champ today winning all three games in Group 1. NAJAT REIKES won high game during the third round in G1 scoring 1078. JOYCE PALMER played the highest bingo point at 110 for JOINTERS in G2. After several months of waiting BILL LAPINSKI found a 12-letter word REGIONALIZES and took the contents of the pot for 12- to 13-letter words. The first winner of this pot was Najat Reikes when she played REPRESENTING on Dec. 6, 2012, and the second winner was Pat Reed by playing REINVESTMENTS on March 21, 2013. This pot will start all over again with $15. The pot for 14+ letters is still waiting, and now has $240. Congratulations to all the winners, including those who found the assigned word categories. Please note that another prize category will take effect on the next Superscrabble Club games: An award for the highest cumulative points after 3 games, whether you win all the games or not. If you wish to contribute a list of words to study, please email your list to Maliha for inclusion in the next blog. The next Superscrabble Club games are scheduled for 9-11-14. I’m going to tell you a story about a gal named Maliha, a guy named Bill, and a 12 letter word. Many of you may know one of the most petite players on the scrabble scene, who is the one with the most dynamic when it come to contributing to exposure of long words. Maliha Mahmood came onto the scrabble scene in the late 90’s when her husband encouraged her to pursue her interest in the game of scrabble. English being her second or maybe third language, there were several obstacles for her to overcome. If you asked me to spell ‘persistent’ I would spell it ‘M’ ‘A’ ‘L’ ‘I’ ‘H’ ‘A’. Where other newbies gave up after experiencing a string of losses in their first few weeks at club, Maliha showed her grit by her persistence, always coming back for more, with a smile on her face, and a determination to conquer this game. Maliha’s prowess at the scrabble board has steadily built over te years. Today she can be a formidable opponent. She competes at clubs, tournaments, and has played more than once in the World Scrabble Tournament too. A few years ago, the longer words, seldom played in scrabble competitions, peaked Maliha’s interest. Unbeknownst to the rest of us, Maliha worked diligently at home in her study, compiling an all inclusive word list of long words. Some of these words are 22 letters long and longer. About the same time Maliha developed the idea of creating a club to play ‘Super Scrabble’ where these longer words could find their way onto the board. In September of 2012, Maliha hosted the first Super Scrabble club in her home in Tustin, California. For players she recruited players from the local scrabble community. Like everything else she does, the event was elegant; there were the games, there was a catered meal, and she even funded prizes to create incentives. Since it’s beginning, the club has met twice each month on the 2nd and 4th Thursdays. Each time the club met, Maliha contributed $5 into a pot that could be won if a player created a legal scrabble word of 12 or more letters long. Obviously, the only way to accomplish this feat is to play one or more extensions to some word already on the board. It is no easy task. Over the months the pot as grown and grown ever larger. Mark your calendar. We meet again on August 28, 2014. Please let me know if you’re coming via email, home (714) 544-4746, thru cell phone, or text message (714) 654-4308. New comers are welcome. We’ll be glad to show you how to play the most enjoyable mental game worthy of experiencing. We start at 10:00 a.m., have a get-together lunch break; and two more games in the afternoon. To qualify for a prize, all words played that fits the category assigned must have 5 letters. First game category is something to do with food. Examples: sandwich, roast, beefs, turkey, fries, bread, toast, cheese, chicken, potato, grilled, soups, challa, challah, tandoori, poori, etc.Second game category is about beliefs and practices: buddha, prajna, enlightenment, buddhi, rabbi, torah, salaam, hafiz, qadis, cadis, kadis, priest, bishop, popes, meditation, praying, etc. All day category (two chances): Words starting with BAD… and/or BAF… To qualify, the word must contain 5 letters. BILL LAPINSKI is undefeated for the third consecutive time in Superscrabble Club games, Group 1. Congratulations! Bill’s improvement in this game is remarkable: (a) winning all three games, (b) highest game-point during the second round at 1166, (c) most bonus words played–17 good bingo words, and (d) high-bingo point at 113 for UNDERRUN in G1. NAJAT REIKES won high game during third round as a floater G1/G2 scoring 1107. RENEE KAHN G2 played the highest bingo point at 94=WRESTLES. GRAVELS, ROASTER, OUTLINE; ANTIAIR, MARKETS, CONCOURSE, ARTICLE, FATTENER, REEDIEST, READING, DRESSER, RATTAIL, HEDGERS; FLEECES, RELENTS, SORRELS, SMOKERS, WRESTLES; UNROOFS, ENTRIES, SATINET, WRACKED, VALIDATE, INANEST, UNEASILY, TORSION, EARTHMEN, UNDERRUN, ZONATED, SUASION, REFASTEN, FLITTER, GOONIES, STRICTLY, MALTOSE; REMOUNT, ATONERS, DROOLER; UNFASTEN, ARISTAE, SERIALS, ATONIES, UNPAINTED, STINGRAY, DEVOTES; TAENIAS, FARADAYS, DIRECTOR, FONDLERS, THEORIES; PARTIES, ELATORS, CONVENTS, LOATHER, PLAITERS, STRADDLE, CONSIDER, RECLINES; ROISTERS, PRINTED, ARENITE, SOARING, GELATES, HEALERS, SINNERS, RELENTS; CARRIES, SHEETING, ZEATINS, DIGESTED, MISAIMS, HEROINE, ENROOTS; CAUSING, ENCASING, EROTISE*, UNSOILS*, REMOVES, ANTLERS; MELTING, SCAVENGE, ATOMISED, GRISTED*, SWIFTEST, EARTHEN, NUTTIEST. If you wish to contribute a list of words to study, please email your list to Maliha for inclusion in the next blog. 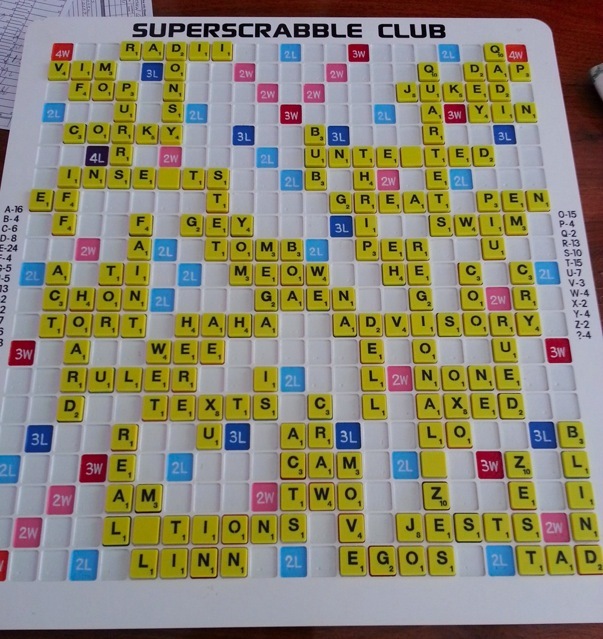 The next Superscrabble Club games are scheduled for 8-28-14. Mark your calendar: Superscrabble Games August 14, 2014. Please let me know if you’re coming via email, phone (714) 544-4746, cell phone, or text message (714) 654-4308. New comers are welcome. First game category is something to do with travelling. Examples: luggage, destination, totes, duffle, duffel, seatbelt, handbag, umbrella, coats, shoes, passport, trains, airport, boats, concourse, flight, etc. Second game is pertaining to birthdays: nativity, firstborn, party, gifts, celebrate, happy, gifting, cakes, banquet, dance, zodiac, zodiacal signs, gemini, scorpio, libra, cancer, celebration, etc. Third game is something to do with playing scrabble: board, tiles, scrabble, stats, score, sheets, cumulative, total, challenge, double, triple, counting, exchange, phoney, statistic, scrabble tourney, etc. ERRATIC, ERRATICAL, ERRATICALLY, ERRATICISM, ERRATICISMS, ERRATICS, ERRATUM, ERRED, ERRHINE, ERRHINES, ERRING, ERRINGLY, ERRONEOUS, ERRONEOUSLY, ERRONEOUSNESS, ERRONEOUSNESSES, ERROR, ERRORLESS, ERRORS, ERRS. ERR, BERRIES. Hey, be positive and focus on the possibilities. BUFFALOBERRIES might just pop up for you to taste, a North American bush with edible red or yellow berries. The total in the box for words with 14+ letters is now @235. Example of 14+ letter-word: ETHEREALNESSES, ETHEREALIZATION (ether, real, ethereal, etherealness, etherealization, etc. IZATION–7 letters, but not acceptable to play by iteself; there’s a possibility that it may appear on your rack. Again I challenge you all to find the longest playable word! Congratulations to Marcia Wade for getting the 1st place award, and to Gretchen Cowan for winning the "Best Performance Award" in TWL Div. C at the WGPO tournament in Madison, Wisconsin. Congrats also to Margie Gordon for the 1st place winner of Gary’s limericks contest.